This Is What It Looks Like to Change a Child’s Life – What Will My Gift Support? On the far side of the indoor basketball court, a line of wobbly-kneed elementary school kids stomps through a sequence of shuffle-step, shuffle-step with their dance teacher clapping time. Their shiny, tiny tap shoes clobber the gymnasium with sounds, their faces an endearing mix of intense concentration and unadulterated joy. Out of context, this line of adorable grade schoolers looks like any other kids’ dance class, but there is a stark difference: these children are in the temporary safety of Metropolitan Ministries’ shelter, their lives upended by homelessness, domestic violence and other horrors beyond their control and not of their making. Facing an uncertain future and abrupt changes, these children have this dance class in which to feel their joy, to be kids among kids, to have a normal, kind, loving thing happen to them at a predictable time every week. This one dance class helps hold their worlds together. This one dance class works its small, tireless magic to calm the beast of trauma ravaging their lives. 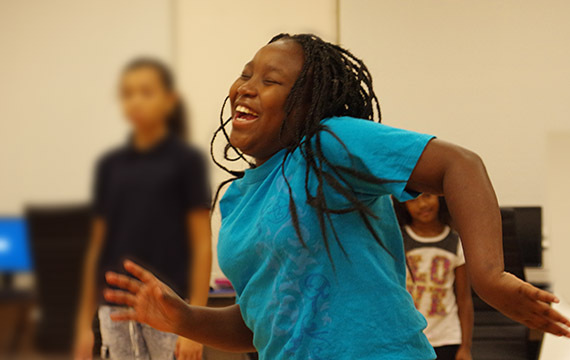 Quietly and tenaciously, the Straz Center has offered performing arts classes for the children of Met Min since 2007. Today, we offer in-school and after-school programs. We are there for hip-hop class, tap class, ballet class, music and theater. We are there when homeless children need hope, need a way to communicate without violence, need to feel confident and hear a roomful of people applauding their achievement. Some of those elementary-aged kids clomping through shuffle-step at the end of the basketball court? They’ll get full scholarships to train at the Patel Conservatory—and who knows where they’ll be able to go after that. Every one of our classes for Met Min children happen 100% through donor support. When you give to The Straz, you’re also giving to Met Min and every one of our other 44 community partners. That’s what we call playing it forward. Together, we can keep changing lives through the power of the performing arts. Love Never Dies: One donor’s heartbreaking heartwarming story of love, loss and homecoming at The Straz.